Steering is the collection of components, linkages, etc. which allows any vehicle (car, motorcycle, bicycle) to follow the desired course. An exception is the case of rail transport by which rail tracks combined together with railroad switches (and also known as 'points' in British English) provide the steering function. The primary purpose of the steering system is to allow the driver to guide the vehicle. The most conventional steering arrangement is to turn the front wheels using a hand–operated steering wheel which is positioned in front of the driver, via the steering column, which may contain universal joints (which may also be part of the collapsible steering column design), to allow it to deviate somewhat from a straight line. Other arrangements are sometimes found on different types of vehicles, for example, a tiller or rear–wheel steering. Tracked vehicles such as bulldozers and tanks usually employ differential steering—that is, the tracks are made to move at different speeds or even in opposite directions, using clutches and brakes, to bring about a change of course or direction. Caster angle θ indicates kingpin pivot line and gray area indicates vehicle's tire with the wheel moving from right to left. A positive caster angle aids in directional stability, as the wheel tends to trail, but a large angle makes steering more difficult. Curves described by the rear wheels of a conventional automobile. While the vehicle moves with a constant speed its inner and outer rear wheels do not. The basic aim of steering is to ensure that the wheels are pointing in the desired directions. This is typically achieved by a series of linkages, rods, pivots and gears. One of the fundamental concepts is that of caster angle – each wheel is steered with a pivot point ahead of the wheel; this makes the steering tend to be self-centering towards the direction of travel. 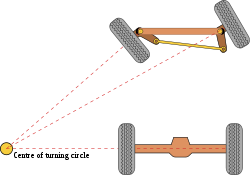 The steering linkages connecting the steering box and the wheels usually conform to a variation of Ackermann steering geometry, to account for the fact that in a turn, the inner wheel is actually travelling a path of smaller radius than the outer wheel, so that the degree of toe suitable for driving in a straight path is not suitable for turns. The angle the wheels make with the vertical plane also influences steering dynamics (see camber angle) as do the tires. 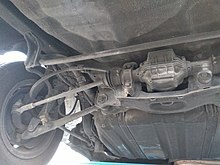 Many modern cars use rack and pinion steering mechanisms, where the steering wheel turns the pinion gear; the pinion moves the rack, which is a linear gear that meshes with the pinion, converting circular motion into linear motion along the transverse axis of the car (side to side motion). This motion applies steering torque to the swivel pin ball joints that replaced previously used kingpins of the stub axle of the steered wheels via tie rods and a short lever arm called the steering arm. The rack and pinion design has the advantages of a large degree of feedback and direct steering "feel". A disadvantage is that it is not adjustable, so that when it does wear and develop lash, the only cure is replacement. BMW began to use rack and pinion steering systems in the 1930s, and many other European manufacturers adopted the technology. American automakers adopted rack and pinion steering beginning with the 1974 Ford Pinto. Older designs use two main principles: the worm and sector design and the screw and nut. Both types were enhanced by reducing the friction; for screw and nut it is the recirculating ball mechanism, which is still found on trucks and utility vehicles. The steering column turns a large screw which meshes with nut by recirculating balls. The nut moves a sector of a gear, causing it to rotate about its axis as the screw is turned; an arm attached to the axis of the sector moves the Pitman arm, which is connected to the steering linkage and thus steers the wheels. The recirculating ball version of this apparatus reduces the considerable friction by placing large ball bearings between the screw and the nut; at either end of the apparatus the balls exit from between the two pieces into a channel internal to the box which connects them with the other end of the apparatus, thus they are "recirculated". The recirculating ball mechanism has the advantage of a much greater mechanical advantage, so that it was found on larger, heavier vehicles while the rack and pinion was originally limited to smaller and lighter ones; due to the almost universal adoption of power steering, however, this is no longer an important advantage, leading to the increasing use of rack and pinion on newer cars. The recirculating ball design also has a perceptible lash, or "dead spot" on center, where a minute turn of the steering wheel in either direction does not move the steering apparatus; this is easily adjustable via a screw on the end of the steering box to account for wear, but it cannot be entirely eliminated because it will create excessive internal forces at other positions and the mechanism will wear very rapidly. This design is still in use in trucks and other large vehicles, where rapidity of steering and direct feel are less important than robustness, maintainability, and mechanical advantage. The worm and sector was an older design, used for example in Willys and Chrysler vehicles, and the Ford Falcon (1960s). To reduce friction the sector is replaced by a roller or rotating pins on the rocker shaft arm. Generally, older vehicles use the recirculating ball mechanism, and only newer vehicles use rack-and-pinion steering. This division is not very strict, however, and rack-and-pinion steering systems can be found on British sports cars of the mid-1950s, and some German carmakers did not give up recirculating ball technology until the early 1990s. Other systems for steering exist, but are uncommon on road vehicles. Children's toys and go-karts often use a very direct linkage in the form of a bellcrank (also commonly known as a Pitman arm) attached directly between the steering column and the steering arms, and the use of cable-operated steering linkages (e.g. the capstan and bowstring mechanism) is also found on some home-built vehicles such as soapbox cars and recumbent tricycles. Power steering helps the driver of a vehicle to steer by directing some of its power to assist in swiveling the steered road wheels about their steering axes. As vehicles have become heavier and switched to front wheel drive, particularly using negative offset geometry, along with increases in tire width and diameter, the effort needed to turn the wheels about their steering axis has increased, often to the point where major physical exertion would be needed were it not for power assistance. To alleviate this auto makers have developed power steering systems, or more correctly power-assisted steering, since on road-going vehicles there has to be a mechanical linkage as a fail-safe. There are two types of power steering systems: hydraulic and electric/electronic. A hydraulic-electric hybrid system is also possible. A hydraulic power steering (HPS) uses hydraulic pressure supplied by an engine-driven pump to assist the motion of turning the steering wheel. Electric power steering (EPS) is more efficient than hydraulic power steering, since the electric power steering motor only needs to provide assistance when the steering wheel is turned, whereas the hydraulic pump must run constantly. In EPS, the amount of assistance is easily tunable to the vehicle type, road speed, and even driver preference. An added benefit is the elimination of environmental hazard posed by leakage and disposal of hydraulic power steering fluid. In addition, electrical assistance is not lost when the engine fails or stalls, whereas hydraulic assistance stops working if the engine stops, making the steering doubly heavy as the driver must now turn not only the very heavy steering—without any help—but also the power-assistance system itself. An outgrowth of power steering is speed sensitive steering, where the steering is heavily assisted at low speed and lightly assisted at high speed. Auto makers perceive that motorists might need to make large steering inputs while manoeuvering for parking, but not while traveling at high speed. The first vehicle with this feature was the Citroën SM with its Diravi layout, although rather than altering the amount of assistance as in modern power steering systems, it altered the pressure on a centring cam which made the steering wheel try to "spring" back to the straight-ahead position. Modern speed-sensitive power steering systems reduce the mechanical or electrical assistance as the vehicle speed increases, giving a more direct feel. This feature is gradually becoming more common. Early example of four-wheel steering. 1910 photograph of 80 hp Caldwell Vale tractor in action. 1937 Mercedes-Benz Type G 5 with four-wheel steering. Sierra Denali with Quadrasteer, rear steering angle. Articulated Arnhem trolleybus demonstrating its four-wheel steering on front and rear axles (2006). Heavy transport trailer with all-wheel steering remote controlled by a steersman walking at the rear of the trailer (2008). 2007 Liebherr-Bauma telescopic handler using crab steering. Hamm DV70 tandem roller using crab steering to cover maximum road surface (2010). Agricultural slurry applicator using crab steering to minimise soil compaction (2009). Four-wheel steering is a system employed by some vehicles to improve steering response, increase vehicle stability while maneuvering at high speed, or to decrease turning radius at low speed. Four-wheel steering found its most widespread use in monster trucks, where maneuverability in small arenas is critical, and it is also popular in large farm vehicles and trucks. Some of the modern European Intercity buses also utilize four-wheel steering to assist maneuverability in bus terminals, and also to improve road stability. The first rally vehicle to use the technology was the Peugeot 405 Turbo 16. Its debut was at the 1988 Pikes Peak International Hill Climb, where it set a record breaking time of 10:47.77. The car would go on to victory in the 1989 and 1990 Paris-Dakar Rally, again driven by Ari Vatanen. Previously, Honda had four-wheel steering as an option in their 1987–2001 Prelude and Honda Ascot Innova models (1992–1996). Mazda also offered four-wheel steering on the 626 and MX6 in 1988. General Motors offered Delphi's Quadrasteer in their consumer Silverado/Sierra and Suburban/Yukon. However, only 16,500 vehicles were sold with this system from its introduction in 2002 through 2004. Due to this low demand, GM discontinued the technology at the end of the 2005 model year. Nissan/Infiniti offer several versions of their HICAS system as standard or as an option in much of their line-up. In the early 2000s, a new generation of four-wheel steering systems was introduced into the market. At first 2001 BMW equipped its 7 series with an all-wheel steering system (optional, called 'Integral Active Steering'), which is now available on the current 7 series, 6 series and 5 series as an option. Renault introduced an optional all-wheel steering called '4control' in 2009, at first on the Laguna GT, which is currently available on the Talisman, Mégane and Espace vehicle lines. In 2013, Porsche introduced a system on the 991 Turbo as standard equipment. Since 2016, the Porsche Panamera is also offered with an optional all-wheel steering. Audi launched the 2014 Q7 model with an optional system. Also the Japanese OEMs offer luxury segment vehicles equipped with all-wheel steering, such as Infiniti on its QX70 model ('Rear Active Steering') and Lexus on the GS. The Italian OEMs have launched the technology in the model years 2016/17 with the Ferrari F12tdf, the Ferrari GTC4Lusso as well as the Lamborghini Aventador S Coupé. Crab steering is a special type of active four-wheel steering. It operates by steering all wheels in the same direction and at the same angle. Crab steering is used when the vehicle needs to proceed in a straight line but under an angle (i.e. when moving loads with a reach truck, or during filming with a camera dolly), or when the rear wheels may not follow the front wheel tracks (i.e. to reduce soil compaction when using rolling farm equipment). Many modern vehicles have passive rear steering. On many vehicles, when cornering, the rear wheels tend to steer slightly to the outside of a turn, which can reduce stability. The passive steering system uses the lateral forces generated in a turn (through suspension geometry) and the bushings to correct this tendency and steer the wheels slightly to the inside of the corner. This improves the stability of the car through the turn. This effect is called compliance understeer and it, or its opposite, is present on all suspensions. Typical methods of achieving compliance understeer are to use a Watt's link on a live rear axle, or the use of toe control bushings on a twist beam suspension. On an independent rear suspension it is normally achieved by changing the rates of the rubber bushings in the suspension. Some suspensions typically have compliance oversteer due to geometry, such as Hotchkiss live axles, semi-trailing arm IRS, and rear twist beams, but may be mitigated by revisions to the pivot points of the leaf spring or trailing arm, or additional suspension links, or complex internal geometry of the bushings. Passive rear wheel steering is not a new concept, as it has been in use for many years, although not always recognised as such. Front loader with articulated steering (2007). Articulated steering is a system by which a vehicle is split into front and rear halves which are connected by a vertical hinge. The front and rear halves are connected with one or more hydraulic cylinders that change the angle between the halves, including the front and rear axles and wheels, thus steering the vehicle. This system does not use steering arms, king pins, tie rods, etc. as does four-wheel steering. If the vertical hinge is placed equidistant between the two axles, it also eliminates the need for a central differential, as both front and rear axles will follow the same path, and thus rotate at the same speed. Articulated haulers have very good off-road performance. Vehicle-trailer-combinations such as semi-trailers, road trains, articulated buses, and internal transport trolley trains can be regarded as passively articulated vehicles. A few types of vehicle use only rear wheel steering, notably fork lift trucks, camera dollies, early pay loaders, Buckminster Fuller's Dymaxion car, and the ThrustSSC. Rear wheel steering tends to be unstable because in turns the steering geometry changes hence decreasing the turn radius (over steer), rather than increase it (under steer). Rear wheel steering is meant for slower vehicles that need high-maneuverability in tight spaces, e.g. fork lifts. 1971 Lunar Roving Vehicle (LRV) with joystick steering controls. 2012 Honda EV-STER "Twin Lever Steering" concept. The absence of steering column simplifies the car interior design. The absence of steering shaft, column and gear reduction mechanism allows much better space utilization in the engine compartment. The steering mechanism can be designed and installed as a modular unit. Without mechanical connection between the steering wheel and the road wheel, it is less likely that the impact of a frontal crash will force the steering wheel to intrude into the driver's survival space. Steering system characteristics can easily and infinitely be adjusted to optimize the steering response and feel. As of 2007 there are no production cars available that rely solely on steer-by-wire technology due to safety, reliability and economic concerns, but this technology has been demonstrated in numerous concept cars and the similar fly-by-wire technology is in use in both military and civilian aviation applications. Removing the mechanical steering linkage in road going vehicles would require new legislation in most countries. For safety reasons all modern cars feature a collapsible steering column (energy absorbing steering column) which will collapse in the event of a heavy frontal impact to avoid excessive injuries to the driver. Airbags are also generally fitted as standard. Non-collapsible steering columns fitted to older vehicles very often impaled drivers in frontal crashes, particularly when the steering box or rack was mounted in front of the front axle line, at the front of the crumple zone. This was particularly a problem on vehicles that had a rigid separate chassis frame, with no crumple zone. Most modern vehicle steering boxes/racks are mounted behind the front axle on the front bulkhead, at the rear of the front crumple zone. Collapsible steering columns were invented by Béla Barényi and were introduced in the 1959 Mercedes-Benz W111 Fintail, along with crumple zones. This safety feature first appeared[when?] on cars built by General Motors after an extensive and very public lobbying campaign enacted by Ralph Nader. Ford started to install collapsible steering columns in 1968. Audi used a retractable steering wheel and seat belt tensioning system called procon-ten, but it has since been discontinued in favor of airbags and pyrotechnic seat belt pre-tensioners. Steering is crucial to the stability of bicycles and motorcycles. For details, see articles on bicycle and motorcycle dynamics and countersteering. Steering monocycles and unicycles is especially complicated. Differential steering is the primary means of steering tracked vehicles, such as tanks and bulldozers, is also used in certain wheeled vehicles commonly known as skid-steer, and even implemented in some automobiles, where it is called torque vectoring, to augment steering by changing wheel direction relative to the vehicle. Tunnel boring machines are steered by hydraulic tilting of the cutter head. Rail track vehicles (i.e. trains, trams) are steered by curved guide tracks, including switches, and articulated undercarriages. Land yachts on wheels and kite buggies are steered similarly to cars. Ice yachts and bobsleighs are steered by rotating the front runners out of the direction of travel. Snowmobiles steer the same way by rotating the front skis. Horse-drawn sleighs and dog sleds are steered by changing the direction of pull. Zero-turn lawn mowers use independent hydraulic wheel drive to turn on the spot. Ships and boats are usually steered with a rudder. Depending on the size of the vessel, rudders can be manually actuated, or operated using a servomechanism, or a trim tab/servo tab system. Boats using outboard motors steer by rotating the entire drive unit. Boats with inboard motors sometimes steer by rotating the propeller pod only (i.e. Volvo Penta IPS drive). Modern ships with diesel-electric drive use azimuth thrusters. Boats driven by oars (i.e. rowing boats, including gondolas) or paddles (i.e. canoes, kayaks, rafts) are steered by generating a higher propulsion force on the side of the boat opposite of the direction of turn. Jet skis are steered by weight-shift induced roll and water jet thrust vectoring. Water skis and surfboards are steered by weight-shift induced roll only. The rudder of a vessel can steer the ship only when water is passing over it. Hence, when a ship is not moving relative to the water it is in or cannot move its rudder, it does not respond to the helm and is said to have "lost steerage." The motion of a ship through the water is known as "making way." When a vessel is moving fast enough through the water that it turns in response to the helm, it is said to have "steerage way." That is why boats on rivers must always be under propulsion, even when traveling downstream. Airplanes are normally steered by the use of ailerons to bank the aircraft into a turn; the rudder is used to minimise adverse yaw, rather than as a means to directly cause the turn. Missiles, airships and large hovercraft are usually steered by rudder and/or thrust vectoring. Small sport hovercraft have similar rudders, but steer mostly by the pilot shifting their weight from side to side and unbalancing the more powerful lift forces beneath the skirt. Jet packs and flying platforms are steered by thrust vectoring only. Helicopters are steered by cyclic control, changing the thrust vector of the main rotor(s), and by anti-torque control, usually provided by a tail rotor (see helicopter flight controls). ^ a b "Cars | AKC® - Active Kinematics Control - ZF Friedrichshafen AG". www.zf.com. Archived from the original on 2017-04-07. Retrieved 2017-04-06. ^ a b AG, BMW. "BMW 5 Series Sedan: Driving dynamics & Efficiency". www.bmw.com. Archived from the original on 2017-04-06. Retrieved 2017-04-06. ^ "1988 Peugeot 405 T16 GR Pikes Peak". Retrieved 2015-03-16. ^ Murphy, Tom; Corbett, Brian (2005-03-01). "Quadrasteer Off Course". Wards Auto World. Archived from the original on 2011-03-23. Retrieved 2010-06-11. ^ AG, BMW. "BMW 7 Series Sedan : M Performance". www.bmw.com. Archived from the original on 2017-04-06. Retrieved 2017-04-06. ^ AG, BMW. "BMW 6 Series Coupé : Driving dynamics". www.bmw.com. Archived from the original on 2017-04-06. Retrieved 2017-04-06. ^ a b "Feature | All-New MEGANE Sport Tourer | Cars | Renault UK". Renault. Archived from the original on 2017-04-06. Retrieved 2017-04-06. ^ a b "Equipements | Talisman | Véhicules Particuliers | Véhicules | Renault FR". Renault (in French). Archived from the original on 2017-04-07. Retrieved 2017-04-06. ^ a b "Equipements | Espace | Véhicules Particuliers | Véhicules | Renault FR". Renault (in French). Archived from the original on 2017-04-07. Retrieved 2017-04-06. ^ "Porsche 911 Turbo - Rear-axle steering - Porsche Great Britain". Porsche Great Britain - Dr. Ing. h.c. F. Porsche AG. Archived from the original on 2017-04-07. Retrieved 2017-04-06. ^ "Porsche The new Panamera - Rear-axle steering - Porsche Great Britain". Porsche Great Britain - Dr. Ing. h.c. F. Porsche AG. Archived from the original on 2017-04-06. Retrieved 2017-04-06. ^ "Audi Q7 > Audi configurator UK". www.uk.audi.com. Archived from the original on 2017-04-06. Retrieved 2017-04-06. ^ "INFINITI QX70 Specs - Performance Features & Engine Options". Infiniti. Archived from the original on 2017-04-06. Retrieved 2017-04-06. ^ "News&Events, Neuigkeiten". www.lexus.de (in German). Archived from the original on 2017-02-22. Retrieved 2017-04-06. ^ "Ferrari F12tdf: Track-Level Performance on the Road - Ferrari.com". Ferrari GT - en-EN. Archived from the original on 2017-04-07. Retrieved 2017-04-06. ^ "GTC4LUSSO T: maximum control for a unique driving experience". GTC4Lusso T. Archived from the original on 2017-04-07. Retrieved 2017-04-06. ^ "Lamborghini Aventador S Coupé". www.lamborghini.com. Archived from the original on 2017-04-25. Retrieved 2017-04-06. ^ "Audi Technology Portal - Audi A8 - Dynamic all-wheel steering". Audi Technology Portal. Archived from the original on 2017-12-01. Retrieved 2018-05-06. ^ "2009 BMW 750Li and 750i Technology - Inside the 2009 BMW 7 Series". Motor Trend. Archived from the original on 2011-08-05. Retrieved 2011-11-13. ^ Johnson, Erik (June 2007). "2008 Infiniti G37 Sport Coupe - Suspension, Handling, and Four-Wheel Steering". Archived from the original on 2007-06-29. ^ "Porsche 911 Turbo Models - Porsche USA". Porsche HOME - Porsche USA. Archived from the original on 2016-10-08. Retrieved 2018-05-06. ^ "New Renault Espace is Different, Yet the Same [Fresh Photos] - Carscoops". carscoops.com. 2014-10-02. Archived from the original on 2017-07-01. Retrieved 2018-05-06. ^ Tutu, Andrei (2015-09-15). "2016 Renault Megane Brings Four-Wheel Steering, 8.7-inch Touchscreen to Frankfurt". autoevolution.com. Archived from the original on 2017-10-03. Retrieved 2018-05-06. ^ "The Renault Megane RS has four-wheel steering". www.topgear.com. Archived from the original on 2017-10-02. Retrieved 2018-05-06. ^ "Automobiles : l'actualité auto et des grandes marques automobile avec le Parisien". leparisien.fr. Archived from the original on 2017-07-22. Retrieved 2018-05-06. ^ "Toyota Camry Catalog". Archived from the original on 2011-07-11. ^ "Thrust SSC - Engineering". Archived from the original on 2010-11-12. Retrieved 2010-05-26. ^ Smart, Jim. "Collapsible Steering Column Installation". Archived from the original on 2006-12-28. ^ Smyth, William Henry; Belcher, Edward (1867). The sailor's word-book: An alphabetical digest of nautical terms, including some more especially military and scientific ... as well as archaisms of early voyagers, etc. London: Blackie and Son. p. 654. Look up steering in Wiktionary, the free dictionary.